Sporty science mind – Arjun. June 2015 Science mind of the month. Arjun is the Science Mind of the Month in Ashubrn for June 2015. Arjun is a 4th grader and has been attending Science Cosmos since he was in the first grade and loves a good building challenge. Arjun transferred to Ashburn from Chantilly. He started out with us in the beginning robotics programs, creating animals that are animated, and challenging builds such as the carousel and crane. He worked with electrical engineering courses and Mindstorms NXT and EV3 intermediate robotics. 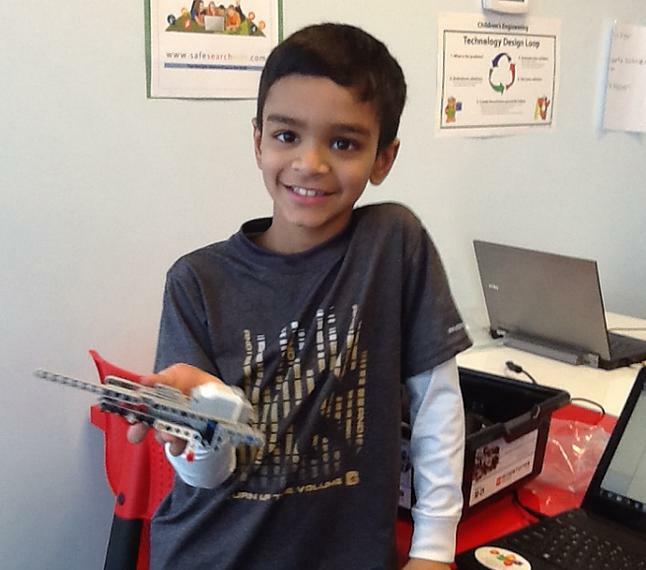 Arjun’s favorite subject in school is math and his favorite movie is the Lego Movie. He loves to play tennis and is in the top 50 Mid-Atlantic Club, but that is not all! He is also a Black Belt in karate, and he studies the guitar! He is a well rounded student and his dream is to become a Tennis Professional when he grows up!